Eleven women below 50 who tried to trek uphill to the Sabarimala shrine in Kerala were told to abandon their attempt by the police after hundreds of protesters blocked their way. Only six of the 11 women planned to enter the shrine while the rest said they came to show solidarity. They arrived at the base camp, Pamba, at 3:30 am today when it was still dark in the hilly area. "Police told us they can't provide us security. They failed us. They evicted us. We will not move. We are determined to pray at Sabarimala," one of the women said. Protests have also intensified against the group of women at the base camp, 4 km from the temple. The protesters say they will not allow these women to reach the hilltop temple. The women earlier told the police that they will not return without darshan (offering prayers). Selvi, coordinator of Manithi, a Chennai-based women empowerment group that's backing the united efforts of the women to reach the temple, said they would abort the attempt to walk 4 km to the shrine of Lord Ayyappa if the police cannot provide security. The 11 women escorted by police teams began their journey by road from Madurai before arriving at Pamba. Five of them said they won't enter the temple and came only to show solidarity to the rest. Some 50 women including the 11 who reached the base camp are coming from several states including Tamil Nadu, Kerala, West Bengal and Odisha. Over a dozen women who tried to enter the shrine separately had to abort their attempt after facing stiff protests. The Supreme Court in September allowed women of menstruating age to enter the Sabarimala temple. "A total of 11 women have arrived. But only six of them want to trek to Sabarimala and the others say they came only to provide protection to them. We are awaiting instructions from senior officials," a police officer at Pamba told NDTV. "We are strategically moving. There are many Dalit women also who are reaching Sabarimala for darshan today. The state and the police have to show enough will to ensure that we can have our rights. We all have taken the required fast (for the darshan)," one of the women told NDTV. Selvi told NDTV that they were "real devotees" who were following the Sabarimala rituals. "Since we are a larger group, we hope we would be able to enter Sabarimala. Most of us are between 20 and 30 years old," she said. "A few women believe what's the guarantee we would live to above 50 to worship here later? Swamy Ayyappa will protect us." In mid-November, Pune resident Trupti Desai wasn't even allowed to leave Kochi airport as hundreds of protesters gathered outside; no taxi driver was also willing to take her to the base camp. Other women who attempted the trek to the shrine had to face assault in a few instances as hundreds of protesters blocked them. A few could reach only up to the entrance of the temple. The Supreme Court has admitted a review petition and will hear the matter in January. 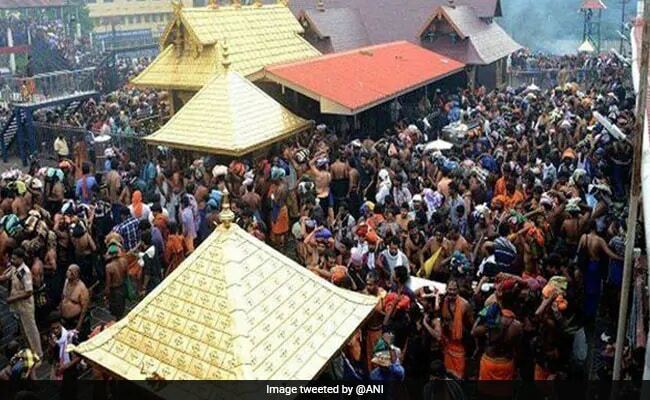 Though the state government says it will provide security to women pilgrims, the Sabarimala temple's chief priest has told the government that he would shut down the temple and stop all rituals if there was any breach in its tradition of letting only girls under 10 and women above 50 enter the shrine. Both the BJP and the Congress are also opposing the entry of women, citing a review petition has been filed.